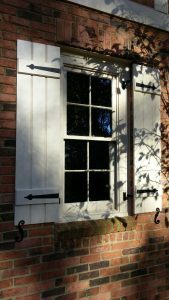 Board and Batten style shutters are actually one of the oldest styles of shutters. Originally shutters were much more functional and provided privacy and security to window openings. Even prior to glass windows you would see a single board or a Board and Batten shutter that can cover the window opening. 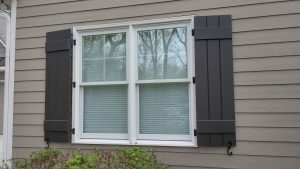 These days Board and Batten style shutters are again in favor, especially where the home owner wants to create a rustic or a relaxed appearance. A Board and Batten shutter consist of 2 main components. The vertical slats are called Boards and traditionally will be tight against each other (remember the security and privacy thing…). The horizontal pieces are called Battens and traditionally would be used to hold the boards in place. With today’s designs and building methods the homeowner can typically choose how many Boards, how wide the Boards should be, the number of Battens and the placement of the Battens. Wider boards tend to create a more rustic look. Typical arrangement will be 3 Boards and 2 Battens, with or without a diagonal piece. If the windows are very tall or you want to add additional visual interest, you could add a third Batten in the center. Another option would be to have more Boards but with a narrower configuration. Examples would be 4 Boards and 2 Battens for a more sophisticated look with lots of visual interest without being too busy. 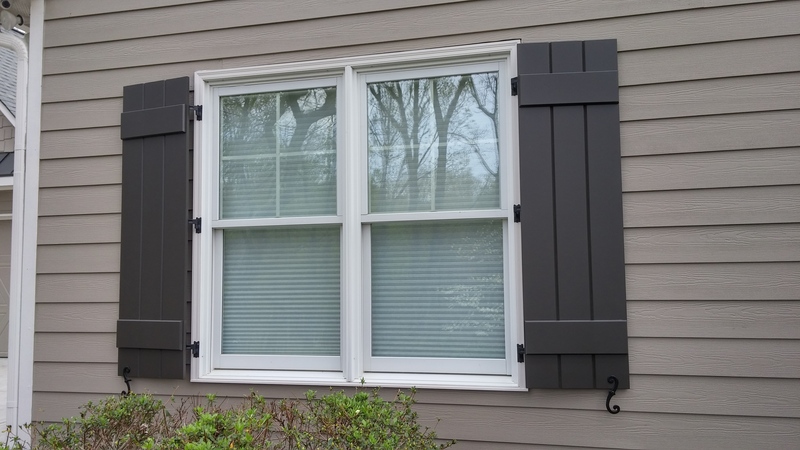 We see this configuration a lot these days on more formal type houses where the homeowner wants to create a cheerful, relaxed look with Board and Batten shutters. A third batten in the center adds to the look, but care should be taken that it does not become too busy. Remember your shutters should enhance the look of your house, never overpowering it. 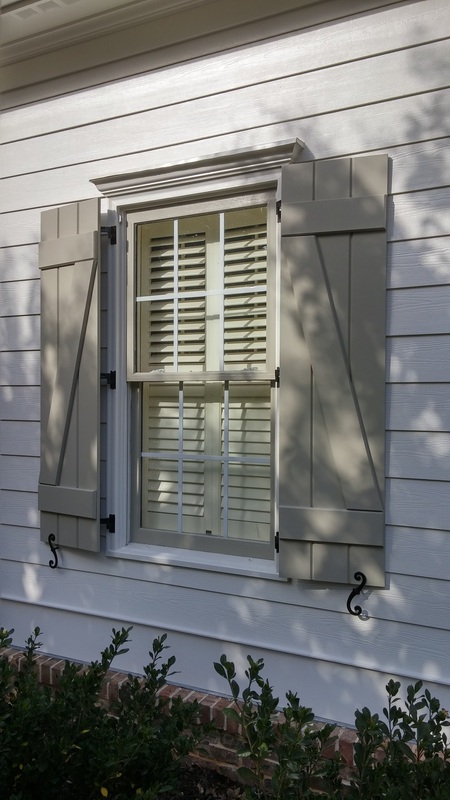 It is easy to add additional features like decorative straps to Board and Batten shutters. Again, make sure the design doesn’t become too busy, but contrasting metal hardware can definitely add to the look. Especially if they are the same design/style that is found somewhere else on the house (like on the garage doors). Board and Batten styled shutters are usually found on Cape Cod, Salt Box, Mission or French Country styled homes having a rock, stucco or siding façade. Board and Batten also work effectively in dressing down a traditional brick home, giving the building a more relaxed look. When attempting to tie together a houses façade with a mix of different construction materials such as rock and stucco, or siding and stucco, Board and Batten styled shutters make an excellent choice. We use your house as our showroom, knowing very well how difficult it can be to see what a specific style of shutter will do the look of your home. We come to your house with samples and will help you to choose the perfect style of shutter for your house. Our business is located in Alpharetta, GA and we are proud to serve the residential and commercial market of North Georgia. We are small enough to provide you with personal attention, yet strong enough to handle complex designs.